Home » How to Manifest » How do I Ask the Universe for Help & Guidance? How do I Ask the Universe for Help & Guidance? The next Law of Attraction Q&A is out. Yippee! The topic for today's question comes from “Lost in Thought.” She wants to know how to ask the Universe for help in knowing what actions to take. I know how frustrating this can be. Should you trust your intuition or not? Is it even your intuition? Is it your mind trying to make things happen? There's nothing wrong if it happens to you. 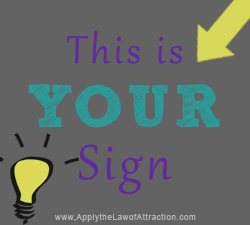 Many teachers over the years have tried to make the Law of Attraction seem like some hidden, mystical secret that it takes years to decipher and a lot of specialized knowledge. That's certainly not the case…. Whenever you want to ask the Universe for help, all you have to do is ask. Yep, that's all there is to it. You can say it silently in your head or shout it from the rooftop. It doesn't matter. The Universe will hear either way. 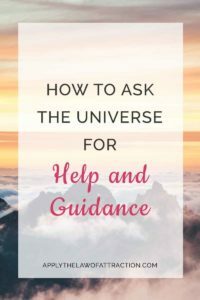 What are some of the ways the Universe will answer your request for help and guidance? When you ask the Universe for guidance, it will answer – always. Keep in mind it may not come in the form of a giant billboard with neon lights and flashing arrows pointing at it. If you ask for a specific sign, the Universe will give you that sign. For example, if you ask for an apple, you might receive an apple, stationary with apples on it, or something similar. Whenever you need guidance, ask the Universe for help. It's always there, always listening, always responding. Love your website !! …. Recently, I came to know about this Law of Attraction and then when I just had a look at my life till date, my life has proved this LOA. So, just recently I have started a conscious manifestation for a big thing of my life. I already felt that Universe has given me signs. As, I came to see a peacock surprisingly immediately the next day, the day before I was talking about seeing a peacock from my balcony. And before that I never saw a peacock from the balcony there, neither my flatmates have ever seen. Also, my friend was taking me to the office and suddenly she played a song that I heard after ages. And the song means ” keep following this path, journey, track…forget all problems…the world is beautiful …., and this road am following is telling me that someone is about to meet me here somewhere… “. And I got this strong sensation, that this is one of the biggest Universal sign for my manifestation of the desire is fulfilled. Also, the next day, I made this affirmation that I am detached from my current manifestation and I am actually feeling so emotionally detached. But yeah, the desire is there in my soft heart. And, must to be mentioned, I am so happy, content, and in love for everything that is and the way it is happening in my life. What is the best way to do LOA “damage control” when you’ve taken an action that wasn’t “inspired action.” For example:actions inspired through anger and are not inspired actions to get what you want. They can really set us back and push us down vibrationally. I’ve found that when this happens to me it takes more energy to get back and I start to have doubts about the entire process. So how does one “come back” from taking such actions and get “back on track”? I understand that fear and anger are “resistance” but everyone deals with these emotions on a weekly, if not daily, basis. To me, it can sometimes seem difficult to recover from these “uninspired actions,” especially if they involve others. Is there a “good way” to deal with fear, anger, etc. on a daily basis and learn to bounce back and forgive yourself for acting through these “negative” emotions? Thanks for all of your time and energy! Hi dear Elizabeth.I really love your website,it helps me a lot.especially the heart energy that you explain,it is really helpful for raising my vibration,thank you. PLEASE,PLEASE help me,how can i get rid of this pain with low of attraction? 2.Can i manifest 3-4 desires at the same moment and time?Or i should manifest one by one? You want to be aware that you created this pain using the law of attraction. I know you didn’t consciously intend to create it, but you did unconsciously create it by default. The good news, that if you were the one who created the pain, you are also the one who can create peace. ”Can i manifest 3-4 desires at the same moment and time? You can manifest billions of desires at the same moment and time. But it can be easier to focus on a few at a time. Focus on as many desires that make you feel good. If you don’t feel good, don’t focus on it, and focus on something else (regardless of the topic) that does make you feel good. Feeling good is the key, regardless of what you use to feel good. Remember, you aren’t focusing on manifesting to “make” something happen. You are focusing on how good the manifestation feels as if it has already happened. You want to focus on the feelings as if you already have that which you desire. Brian your input really inspired me. I realized sometimes I focus on my desires when I am not feeling in a good mood. I am overcoming a period of depression and I realize I created the depression and feeling bad because I focused on what is rather than what will be. How do you put yourself beyond what you see to where you want to be? I saw a video on YouTube and a series of audios named “The Lost Mode Of Prayer”. And he said the lost mode of prayer is the FEELING not TALKING. First, please answer this question; Is my friend’s opinion right? And then, do you know what is the secret in THINK AND GROW RICH (Napoleon Hill)? 😀 I know we have to discover it ourself but my English is not really good and maybe I can’t get it!